Pre-Owned vehicle pricing includes all offers. Tax, Title,Tags and $179.81 Documentary Fee not included in vehicle prices shown and must be paid by the purchaser. While great effort is made to ensure the accuracy of the information on this site, errors do occur so please verify information with a customer service rep. This is easily done by calling us at (847) 272-7900 or by visiting us at the dealership. 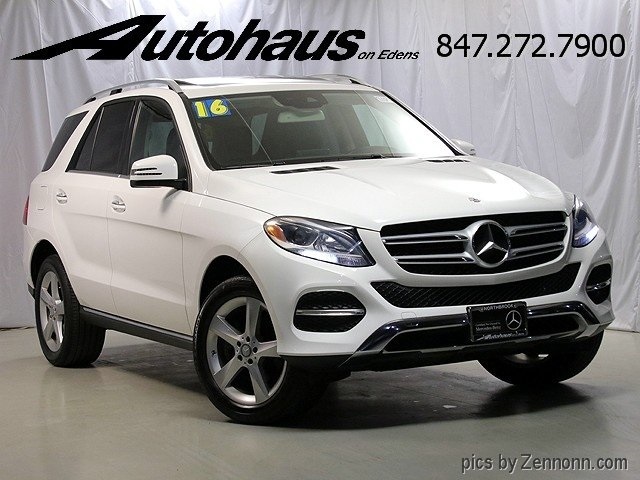 2016 Mercedes-Benz GLE 350 4MATIC® Polar White CARFAX One-Owner. AS LOW AS 1.99% AVAILABLE WITH APPROVED CREDIT, UNLIMITED MILEAGE WARRANTY, LANE TRACKING, KEYLESS GO, 1-OWNER VEHICLE WITH NO REPORTED ISSUES, BLUETOOTH HANDSFREE, NAVIGATION/NAVI/GPS, REAR BACK UP CAMERA, PURCHASED HERE SERVICED HERE, SERVICE RECORDS, 115V AC Power Outlet, Heated Multifunction Steering Wheel, KEYLESS GO , Lane Tracking Package Code, Navigation Updates For 3 Years, Premium Package, Radio: COMAND® System w/Navigation, Region Coding, Single DVD Player, SIRIUS XM Satellite Radio. Why Autohaus on Edens? Why should Mercedes-Benz drivers make Autohaus on Edens their dealer of choice? We pride ourselves on our dedication to world-class customer service. We offer an extensive inventory of Mercedes-Benz CPO sedans, coupes, and SUVs, which our customers can browse from the comfort of our state-of-the-art indoor showroom in Northbrook, IL. Simply speak to one of our expert Mercedes-Benz Service Advisors to have all your questions answered. Reach out today to learn more about our Certified Pre-Owned collection by calling (847) 272-7900, or filling out our contact form.